I’m honored to serve as poet-in-residence at an upcoming Jewish men’s club retreat in the Baltimore, MD area. 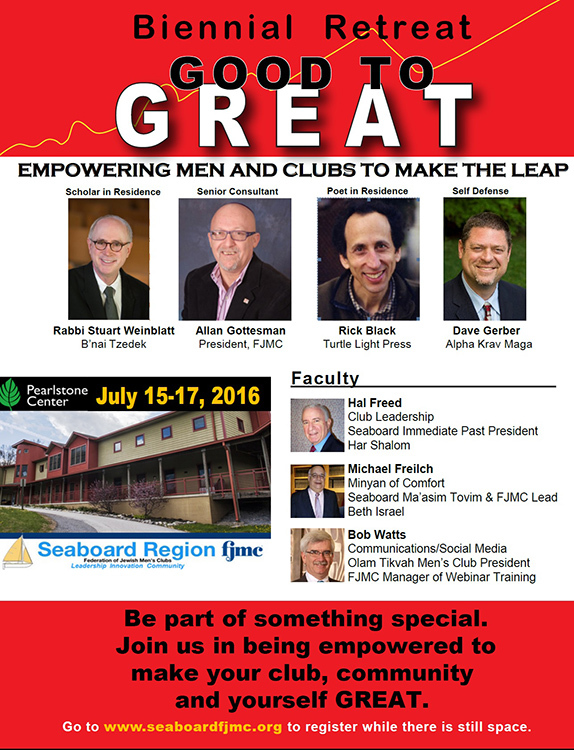 It’s with the Seaboard Jewish Men’s Clubs in the Mid-Atlantic region. The theme of the weekend is the book by Jim Collins, From Good to Great. How can we improve not only businesses but our community organizations and interactions with each other? I look forward to doing a talk about how to confront the “Brutal Facts” and a poetry reading that features some of my poems about Israel and being a Jew today. It’ll be fun to meet folks and participate in some of the other sessions.